Every kitchen needs a good stockpot. It may as well dress up the place while it is doing its duties. A pan like this is a once-in-a-generation purchase which will last through every batch of corn on the cob, simmer tomato sauce like a champ, and allow you to prepare homemade stock like nothing you can find in the grocery aisle. This gleaming treasure is from the Cuisinart Chef's Classic line. The all-metal handles are made with grips manufactured into the underside of the handle, just one feature of many of a strong pan designed to be easy to handle when fully loaded. The construction keeps the heat moving into your food from all sides. I have found stainless pans to be so hassle-free to clean by hand that I won't argue over washing them myself (as long as the food was good) when my partner goes crazy and uses every pan in the house for a meal. You may burst into spontaneous applause and have to explain yourself when you prepare large amounts of produce inside, yet get to the bottom of the pot to find nary a burn or difficult mess. Whether you prepare large amounts or smaller, troublemaking dishes which like to spit, the pot can contain it all. 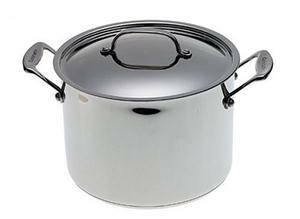 Compare this with Farberware's 8-quart stainless steel stockpot.